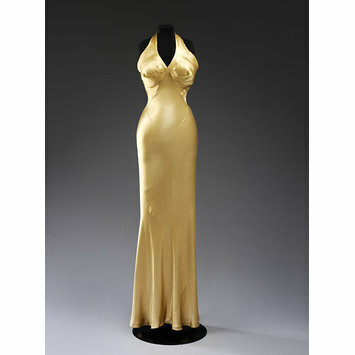 Charles James created this elegant bias-cut evening dress. The British-born designer (1906-1978) worked as a milliner and dressmaker in New York between 1924 and 1929 and in 1929 opened premises in London. During the early 1930s he travelled extensively between London and Paris, establishing a Paris branch in 1934. Like Elsa Schiaparelli, James was a friend of the Surrealist painter Salvador Dalí (1904-1989), and made use of Surrealist influences in his designs. He was also fascinated by the cut of historical dress and explored innovative new forms of garment construction, such as spiral draping. Among his most important works are the taxi dress, the pneumatic padded jacket and the Sylphide gown. His forte included the creation of luxurious, full-skirted evening gowns. He regarded dresses as works of art, as did his customers. In 1939 he returned to New York, where he continued to invent and rework toiles and construct extraordinary clothes in lavish fabrics for a devoted clientele. The dress forms part of the Cecil Beaton Collection. This Collection was brought together by the society photographer Sir Cecil Beaton (1904-1980). With great energy and determination Beaton contacted the well-dressed elite of Europe and North America to help create this lasting monument to the art of dress. The Collection was exhibited in 1971, accompanied by a catalogue that detailed its enormous range. Evening dress of satin. It is bias-cut and the bodice is constructed to emphasize the body's curves. It is sleeveless with a plunging back neckline and fastens on the left side with hooks and eyes. There is evidence that the shoulder straps have been altered. "I foresaw a new ideal and gave her the appearance of having more bust and a wider pelvis than would have been admired by the average fashionable woman of the early thirties." The dress forms part of the Cecil Beaton Collection which was brought together by the late Sir Cecil Beaton. With great energy and determination Sir Cecil contacted the well-dressed elite of Europe and America to bring this lasting monument to the art of dress. The collection was exhibited in 1971, accompanied by a catalogue which detailed its enormous range. (catalogue no. 159 page 33). Part of the Beaton collection. Listed as an anonymous donor – Records indicate it was Mary St. John Hutchinson. Front hem face: shows seams coming from the back (diagonal ones) towards the center in the front. Bodice edge: front edge. Atypical construction with an extra piece at the edge of the bodice underneath the arm. 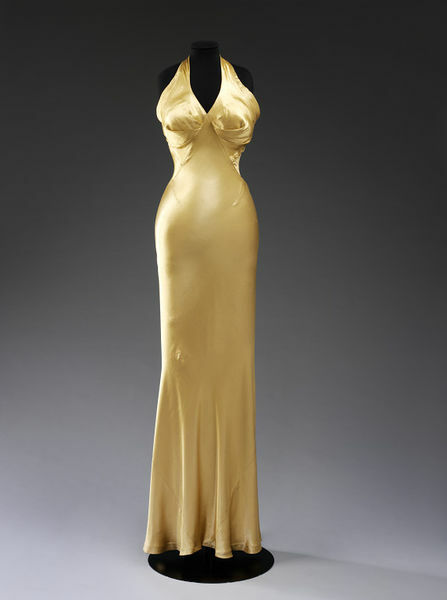 Evening dress of satin, designed by Charles James, London, 1934.